Kata Dalström was a socialist activist and the first female leader of a political party in Sweden. Anna Maria Catharina Carlberg was born at her mother’s parents’ property of Emtöholm in Dalhem parish, on the border between Småland and Östergötland. A few years later the family moved to the small village of Kopparberg in Bergslagen where her father, Professor Johan Oscar Carlberg, established a copper foundry. Kata, as she came to be known, was homeschooled by governesses, apart from a few years spent at the Emilie Risberg junior school for girls at Örebro. She was expelled from the school in 1872 as she was viewed as a threat to the general peace and moral at the school. In 1878 Kata Dalström married the significantly older Gustaf Dalström. Being an engineer his job took him and his family to various locations in Sweden. The couple had seven children together. When the family spent some time living in Stockholm during the 1880s Kata Dalström became involved with Föreningen för gift kvinnas äganderätt (the Married Woman’s Property Rights Association), Qvinnoklubben (“the Women’s Club”) and Utilistiska samfundet (“the Utilitarian Society”), which campaigned against the state church and all belief in the supernatural. She also helped establish Katarina Arbetsstuga (a type of practical school for poor children), where she was active for a few years. During this time Kata Dalström was also a productive author. In 1887 she published her first book, Nordiska gudasagor för barn och ungdom, followed by Nordiska hjeltesagor för ungdom in 1889 and Grekiska guda- och hjeltesagor in 1893. She also wrote articles for various journals. In 1892 Kata and her family settled in Stockholm permanently and Kata, through her friend Ellen Key, became a member of Tolfterna, which brought together women of the bourgeoisie and the working class. Against the wishes of her husband and her family she joined Stockholm’s Allmänna Kvinnoklubb (“the Public Women’s Club”) in 1894, thus also joining the Socialdemokratiska Arbetarparti (SAP) (the social democratic workers’ party). Kata Dalström soon held a number of positions within SAP, during different periods serving as member of the board for Kvinnoklubben, for the party district and on the Kommitté för den kvinnliga agitationen, which later became Kvinnornas Fackförbund (the Women’s Trade Union Association). In 1900 Kata Dalström got so many votes in the election for the board of the SAP that she became part of the executive committee. This meant that she was at the head of the national strike in 1902, a nationwide three-day workers’ strike in support of the demand for universal suffrage. It was in connection with a demonstration during the mass strike that she was arrested for the first time; it was not the last. Kata Dalström would come into conflict with the authorities on many occasions in the intervening years, but although she was fined several times she, unlike many fellow party members, never ended up in prison. She was, however, frequently forced to deliver her speeches outdoors, standing on a rock or at some road junction because no one was willing to open their premises to socialist activists. Around the turn of the century Kata Dalström became increasingly sought after as an activist. Despite her protestations that she did not want to be an activist solely for women she was widely requested to establish women’s clubs across the country. Kata Dalström was also frequently employed by Textilarbetareförbundet (the Textile Workers’ Association), whose workforce largely comprised women. She was also approached as an activist by miners, navvies and stonemasons. “Fru Kata” was an accomplished demagogue: electrifying, shrill, often dramatic and almost always generated a sizeable audience. At the 1905 party conference Kata Dalström was not re-elected onto the executive committee. She was at this point on the left wing of the party, which was particularly represented in the social democratic youth association, which frequently employed her as a travelling speaker. In 1906 Gustaf Dalström died. Kata Dalström had used up the money which she had inherited on the death of her parents and she was still responsible for providing for several of her children. The fees from her activism became increasingly vital to her and she often waited months for reimbursement. She also wrote many political pamphlets and in 1914 she published a collection of travel letters under the title Härjatåg kors och tvärs genom Sverige. Certain themes reoccurred in Kata Dalström’s activism. Lectures on the right to vote and the importance of organising and fighting against the clergy were particularly sought after. In a talk entitled “Can a Christian be a social democrat?” she claimed that the state church had betrayed the Christian message of brotherly love and common property. Kata Dalström’s stance was that a Christian both could and should be a social democrat. She emphasized the importance of education in all contexts and after giving political talks she liked to give an additional lecture on art, literature or history. After SAP split in 1917 Kata Dalström formed part of the leadership of the newly established Socialdemokratiska Vänsterparti (social democratic left party). Subsequently this party also split and in 1921 Sveriges kommunistiska parti (SKP) was founded, as a part of the Communist International (often called Comintern). She was intermittently part of the SKP leadership but during her final years she came into conflict with the more loyal Comintern party members. Along with her close friends Zeth Höglund and Fredrik Ström, who shared her opinions, she became severely critical of the centralisation of all power by the Comintern’s executive committee, which itself was entirely dominated by the Russian communist party. She, in turn, became criticised by leading party members partly for her “bourgeois” view of education, partly for her pronounced religious beliefs. 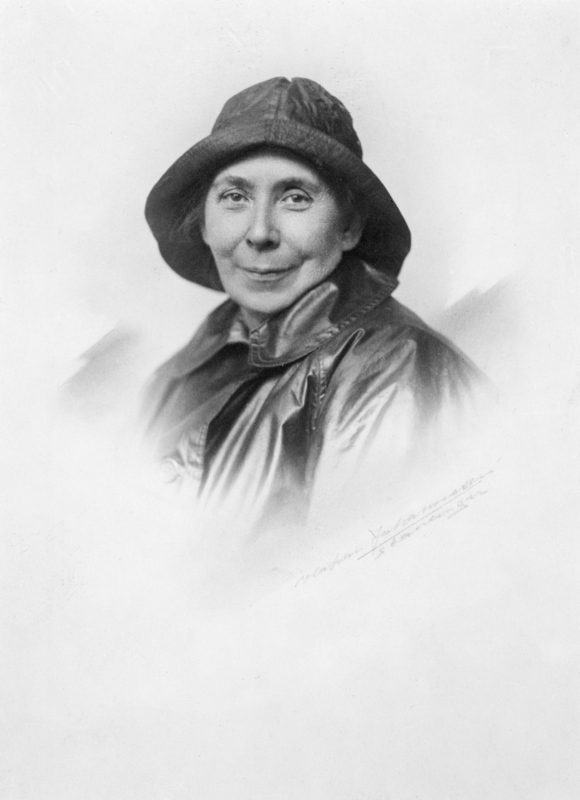 Kata Dalström’s interest in spiritual matters, namely theosophy and spiritualism, was piqued in the 1890s and remained with her for life. She never hid the fact that she saw herself as a religious person and already in the early 1900s she called herself a Buddhist. The opinions she expressed in her lectures on theosophy, spiritualism and what was then called “psychophysical research” were seen to be incompatible with membership of the communist party. But Kata Dalström remained firm in her resolve and defended herself both in speech and in writing. Kata Dalström died on 11 December 1923 after suffering several months’ of heart problems. She is buried at Norra cemetery in Solna. There are streets named after her in Fruängen, Stockholm and in Kopparberg. Anna Maria Katarina (Kata) Dalström, www.skbl.se/sv/artikel/KataDalstrom, Svenskt kvinnobiografiskt lexikon (article by Gunnela Björk), retrieved 2019-04-19.